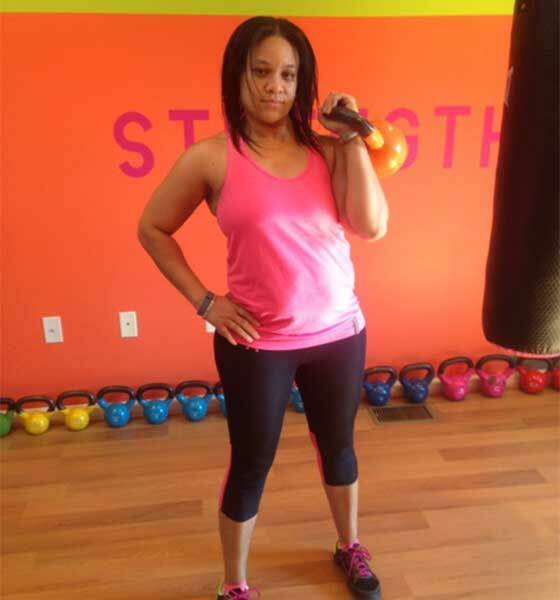 Lovie is a Certified Kettlebell Kickboxing™ Instructor (KBIA) in the DMV (DC, MD and VA) area. She has also earned her Certified Personal Trainer (CPT) certification through the National Academy of Sports Medicine (NASM) and Certified TRX Suspension Trainer. Lovie always had a passion for fitness…from gymnastics to cheerleading, softball, and track and field. Staying on the cutting edge, she was introduced to kettlebells before they became popular, as they are today, but her busy schedule kept her away from faithfully using them on a consistent basis. After being involved in a horrible car accident (hit by an uninsured motorist) in March 2012, she had to go through physical therapy, and her insurance soon ran out. She needed a way to “rehab” herself to complete her recovery. Her love of kettlebells led her to Dasha’s Kettlebell Kickboxing™ Scorcher Series! Lovie is currently offering private and small group instruction at Fitness Unleashed, LLC in Accokeek, MD (15638 Livingston Road, Unit 2). To get started, with classes, teaching at your facility, or private instruction, call or email her directly at 202.809.8824 or Lovie@FitnessUnleashedLLC.com.